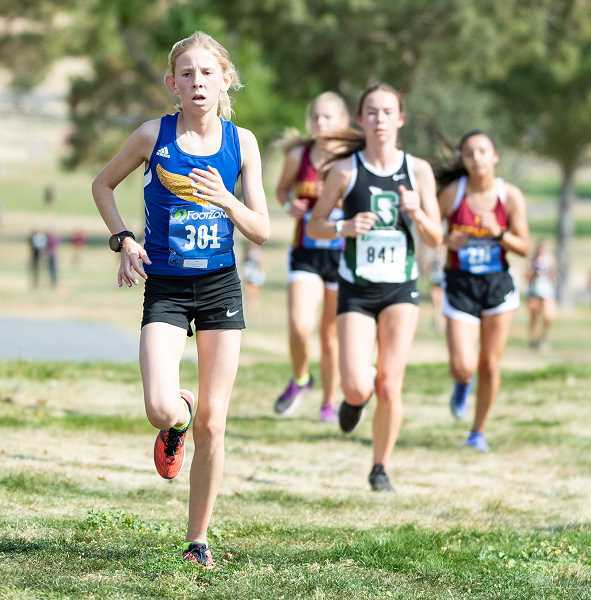 The Crook County Cowboys took control early and dominated the competition, winning the Madras Invitational Cross Country Meet, which was held Saturday at Kah-Nee-Ta. Although the Cowgirls did not run quite as well, they still had a solid meet, taking third place in the girls competition. 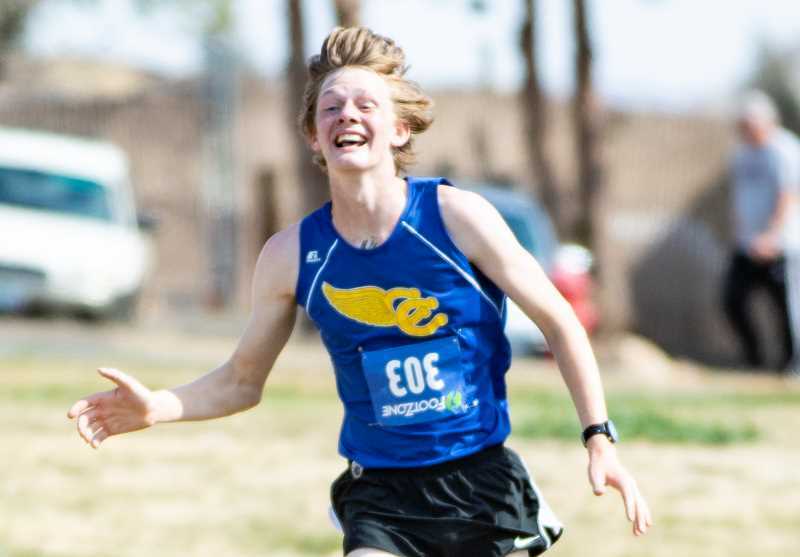 Crook County's Cade Catterson immediately jumped to the front of the boys race as the gun sounded. Miles Chaney, Alec Carne and Alex Vaile followed close behind Catterson. About a mile in, Chaney and Carne caught Catterson and the three ran together for the middle portion of the race. "Our plan before the race was to go out all together as a group and then Cade went ahead so I just stuck with Miles," Carne said of the early portion of the race. Chaney added that once he and Carne caught up with Catterson he went to the front to try to block the wind for his teammates. "They usually beat me, so when we reeled Cade in I went to the front and then they kind of fell back and I kept going," said Chaney, who went on to win the race with a season-best time of 17:00.12. "It feels really good," he said of the victory. "I haven't done that since my sophomore year at JV districts." Carne followed closely behind Chaney, finishing second in 17:10.12, while Catterson finished third in 17:20.89. Alex Vaile, who ran with Chaney and Carne early in the race, faded in the middle, but still had a solid run, finishing seventh overall in 17:54.12. The fifth Cowboy to count in the scoring was Hunter Eller, who finished 14th with a time of 18:24.78. The remaining two Cowboys in the varsity race were Caleb Phay and Jeremy Cartlidge, who finished 20th and 36th, respectively, in 18:53.23 and 19:49.99. The Cowboys finished with 25 points, while Redmond took second with 43 and Summit JV third with 91 points. Rounding out the scoring in the nine-team meet were Riverdale, 124, Gladstone, 139, Mountain View JV, 151, Bend JV, 157, Madras, 211, and Culver, 269. "They did a really good job," Crook County head coach Tracy Smith said of the boys team. "We wanted to get good times today and I think a lot of PRs (personal records) were set by our boys." Smith added that they have been struggling with depth this year, but that problem may have gone away. Jonas Rice, who had not run a race yet this year, dominated the JV race, winning by nearly a minute in a time of 18:01.44. "He was running all by himself," Smith said. "If he was running varsity he probably runs 20 or 30 seconds faster." Other Cowboys in the JV race were Logan Tanner, fifth in 19:08.32, Xavier Layne, 21st in 20:41.90, Jason Slawter, 43rd in 22:07.34, Kaden Ritter, 64th in 23:31.00 and Tucker Bonner, 73rd in 24:05.66. The Cowgirls also ran a solid race, but did not have enough depth to win the team championship. Redmond came away with first place with 42 points, while Summit JV was second with 46 and Crook County finished third with 49 points. Rounding out the scoring were Bend JV, 100, Mountain View JV, 143, Madras, 163, Riverdale, 206, and Culver, 216. Jan Carne had her best race of the year for the Cowgirls, finishing first overall with a time of 20:49.23. "I'm really pleased," Carne said. "I would have liked a better time, but I beat my time at the IMC Preview Meet, so I am happy with that." Smith was also pleased with how well Carne ran. "Jan finally had a breakthrough," he said of her race. McCall Woodward was next in for the Cowgirls and fourth overall with a time of 22:04.23. "It felt really good," she said of the race. "It gave me a lot of confidence and it was a real good race. All of the girls on our team have a similar race pace and we can run close to each other, so we are really good partners." Maggie Ramoss was next in for the Cowgirls, finishing ninth overall with a time of 22:35.23. She was followed by Kelcie Ames, 16th in 23:29.12, Elise Rice, 24th with a time of 24:21.23, and Hannah Dozhier, 31st in 24:39.12. "It was a really good day," Smith said. "We were hoping for some PRs for the year and some overall PRs and we got those." Just two Cowgirls ran in the JV race, with Faith Wagner placing 20th overall in 26:33.23, while Sammy Thornton was 57th with a time of 35:30.89. Crook County has a week to prepare before competing Friday in the Oxford Classics at Drake Park in Bend. The race, which attracts teams from throughout the Northwest, is one of the fastest races of the year. Racing starts with the first JV girls race beginning at 1 p.m. Races continue throughout the afternoon with the girls varsity race set to begin at 2 p.m., the boys varsity race at 2:30 p.m.
Two more JV races follow the varsity races with the final race concluding at approximately 4 p.m. when awards will be given out for the varsity race.